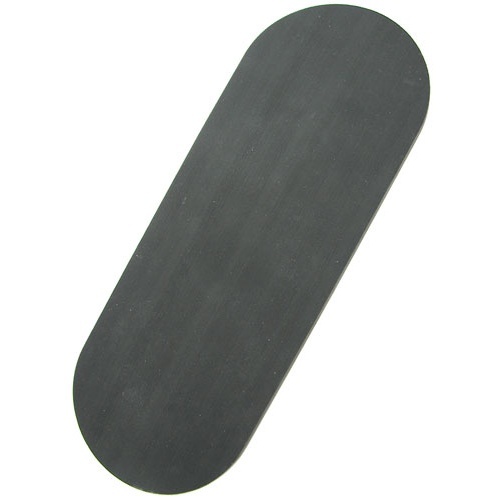 Pure surplus: 11” x 4” x 1/4” thick oblongs (which is to say, rectangles with rounded ends) of dense, black nitrile rubber. It’s like padding, matte on one surface and glossy on the other. 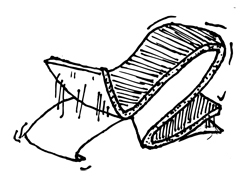 Great for dampening vibration, or wherever you need cushioning. Ready to use as is, and ready to cut to shape. See psychedelic patterns the safe way! 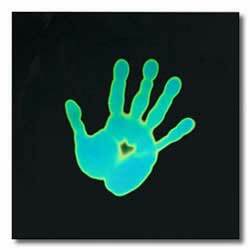 Press your hand on this 6" x 6" sheet of liquid crystal and leave a print of swirling colors that, like the mood ring of yore, you can use as a sign of your mood. The pattern will blend and fade in seconds as the crystals react to temperature. Tiny liquid crystals inside the film-like material react to heat, 25-30°C (77-86°F) by changing colors. 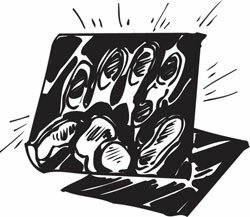 As science, it demonstrates the way liquid crystal displays work. And you can cut it into pieces to incorporate into a science project. Or just leave it out for guests to play with when the party turns boring. 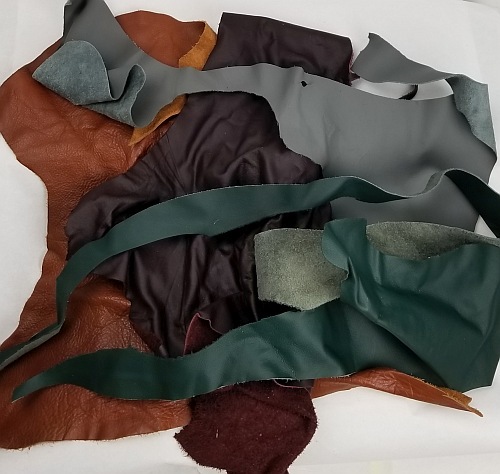 Leather scraps, very assorted. Each 2-lb sack will net you some small pieces and a few larger pieces, from 4" x 12" down to 6" x 2", more or less and give or take, in odd shapes. (If your lucky maybe even one long piece) Think coin purses and bracelets, not belts. Maybe a jacket for a hipster rabbit. Colors are all over the place, from light and dark browns to reds, whites, maroons and more. You get approx (2) pounds total. Have fun and send us pictures of what you made. Call for larger bulkier pricing. 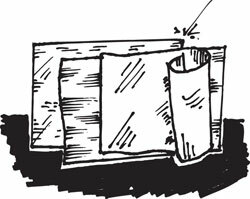 Thin-sheet-metal workers, that is. As in crafter/jeweler/model-maker types. 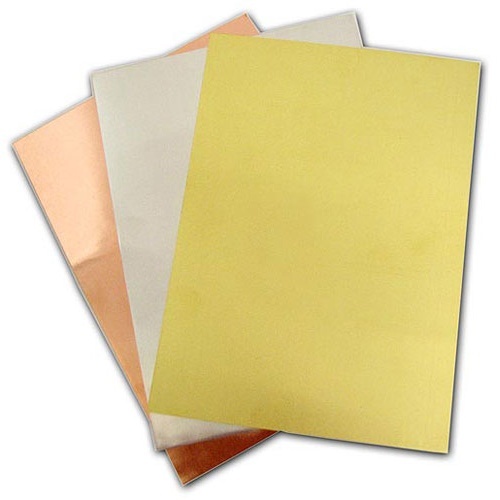 You get a 3-pack of very nice, bendable, metal foil sheets, 5" x 7" x .005" thick, (1) each in copper, brass and aluminum. Much neater and easier not to cut those monster sheets of foam-core into manageable sizes by yourself. Just order the 9" x 12" size! 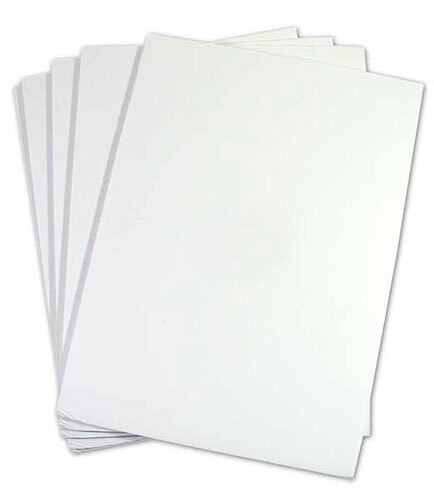 You get a package of (5), each 3/16" thick. 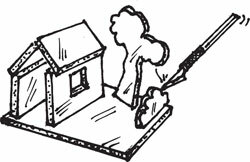 We're thinking a little light model-making, school projects, crafting, photo mounting, lesser bulletin boards, like that. These here are made for repairing tents after critters tried to get inside or somebody bent over too fast with a machete in his belt. 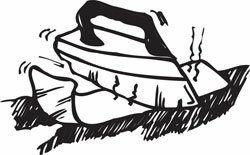 Iron these off-white canvas strips, shiny side down, over the hole and yer tent's like new, almost. Pants too, if ya got off-white canvas britches. Make good iron-on name tags, no matter how short or long your name is. Small are 2" x 2" and the medium are 4" x 2",. Sold in large quantities, in case you have particularly aggressive critters, or an extra-long machete. 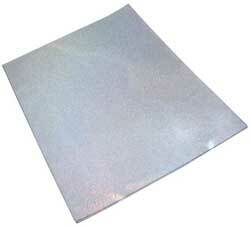 Our medium-gray closed-cell foam comes in 14-1/8" x 3-3/4" x 1/4" thick slices with self-adhesive backing. 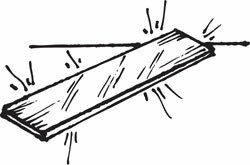 You get two slabs, the better to pad something with. Okay, they’re just strips of metal, but CJ says one of each and a grapefruit will get you at least a “C” at the science fair. 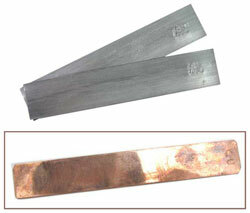 The copper electrode is 100mm long x 18mm wide x .8mm thick (3.94" x .7" x .041”). 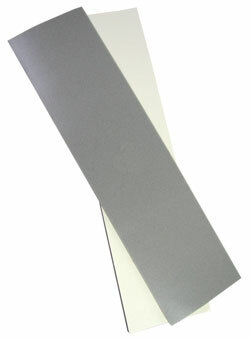 The zinc electrode is 4” long x 3/4” wide x .027” thick and stamped “ZN”. And both of them are awfully useful for crafters and jewelry makers, too. And people won't crash into you, because nothing says safety like this high-quality reflective tape, the same material that's used to make stop signs. 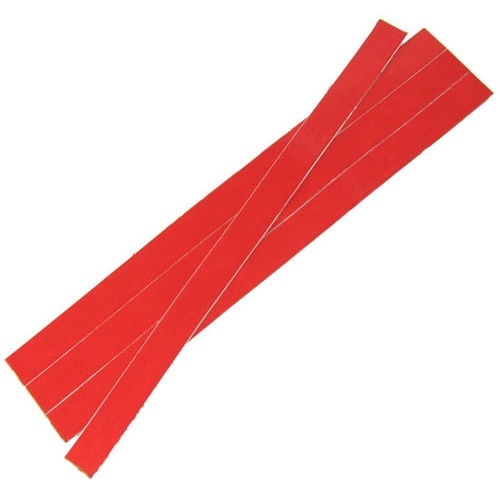 You get (4) glossy, self-adhesive red reflective tapes, 12" long x 3/4" wide. 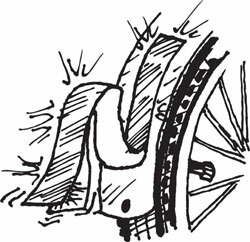 We're thinking bike fenders and helmets, dog collars, garage door frames, anything that could benefit from a heightened visibility. 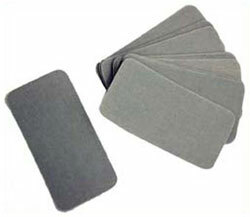 Make your own sparkling magnets with our flexible, cut-able 8-1/2" x 11" sheet of 1/32" thick magnetic rubber. The silver glitter finish under a diffraction layer creates mesmerizing rainbow effects. 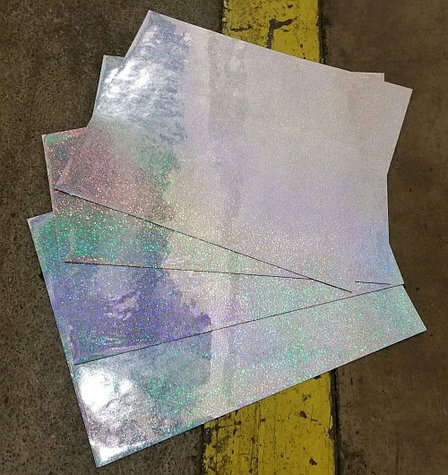 You'll get (3) sheets of magic glitteration to play with. Surplus - with a silver lining! We have almost half a hundred rolls of 18-1/2" wide mylar film, the shiny side printed with a variety of balloon designs - happy birthday, happy retirement, happy other things - and a matte silver finish on the other (picture the two sides of aluminum foil). We'll send you a roll of 20 ft. Lots of craft-project potential. Start with a shiny birthday kite. Move onto hand-made hair scrunchies. 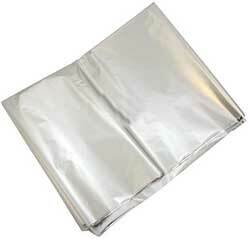 Jim suggests wrapping yourself in it if your car stalls in the Arctic. Philip, always the adventurer, is considering a do-it-yourself dirigible.